When you find yourself in need of a septic system repair and replacement service you are going to want to turn to a team of professionals that get the job done right. 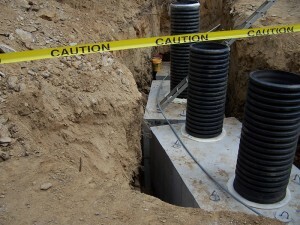 At Delaware Valley Septic, Sewer & Storm, we have years of experience when it comes to making septic system repairs to homes in Gladwyne, Newtown Square, West Chester, Radnor, Villanova, and throughout Chester County and Montgomery County. Every member of our team is certified and has the ability to diagnose and repair or replace any damages that may be present within your system. What Causes the Need for a Septic System Repair? Many factors can contribute to your septic system needing a repair such as age, ground damage, or improper use. Often, these factors can be caught before they cause a major problem with regular inspections. If you learn that your system is in need of maintenance over the course of the examination, it’s important to trust the team that has completed countless septic system repair and replacement jobs throughout the Delaware Valley area. Putting off any needed sewer services your home needs is never recommended. Ignoring problems that you have detected with your system can lead to hazardous situations, and if left for long enough, it can require a septic replacement costing you more money down the road. Homes throughout Chester County, Montgomery County, Gladwyne, Newtown Square, West Chester, Radnor, Villanova can experience blockage, ponding, and a myriad of other problems, which can expose residents of the property to dangerous, untreated wastewaters. When the time comes to replace your septic system, Delaware Valley Septic is the company residents throughout the Delaware Valley can rely on for honest, professional service. Many homeowners in the area will have a septic tank in their yard as opposed to using a municipal sewer system. The extent of your septic replacement can vary based on the initial inspection. Service can range from a simple pipe replacement to completely new septic installation. The area of your property where bacteria lives in soil and breaks down waste is known as the drain field. If the ground around this area has suddenly become soggy or gives off a foul smell, this can signify drain field failure, which is a result of a problem with your septic system. If you begin you begin to notice sewage has made its way into your indoor plumbing system, that means you are going to need to call a septic system repair and replacement company. Delaware Valley Septic has all the equipment necessary to make sure your sewage problem is taken care of as soon as possible. Residents throughout the Delaware Valley who would like more information or would like to schedule a septic system repair and replacement service can contact us today at 1-844-4-DELVAL.